The kennel will reopen on Friday, January 8. Due to unforeseen circumstances in our family we have made the decision to not book any appointments until Friday, January 8. We have decided to take advantage of having very few pups looking for their new homes and have the office repainted and get general repairs and organization taken care of. New litters will be ready for their new home starting Friday, January 8. At that time we will have Shih Tzus, Schnoodles, Yorkipoos, Maltipoos, Poodles, Bichons and Teddy Bears. Although, we are not able to answer the phone at all times, we are checking voicemails a few times a day and calling back asap. If you want to schedule for the weekend starting January 8 for any of the new pups, just let us know. We hope that everyone had a joyful Christmas season. Staff will be in the kennel all week, caring for the puppies that we have available, however we will not be showing. We still have a very nice selection to choose from and can continue scheduling appointments for next weekend starting January 2. I had announced a $25.00 increase on January 1. All of the pups that are still available at this time will still be priced at the 2015 prices. On January 8 our new litters will be available to be shown. These will be shown at the new prices. I have tried to make a note on each link of litters that will be affected by the price increase. 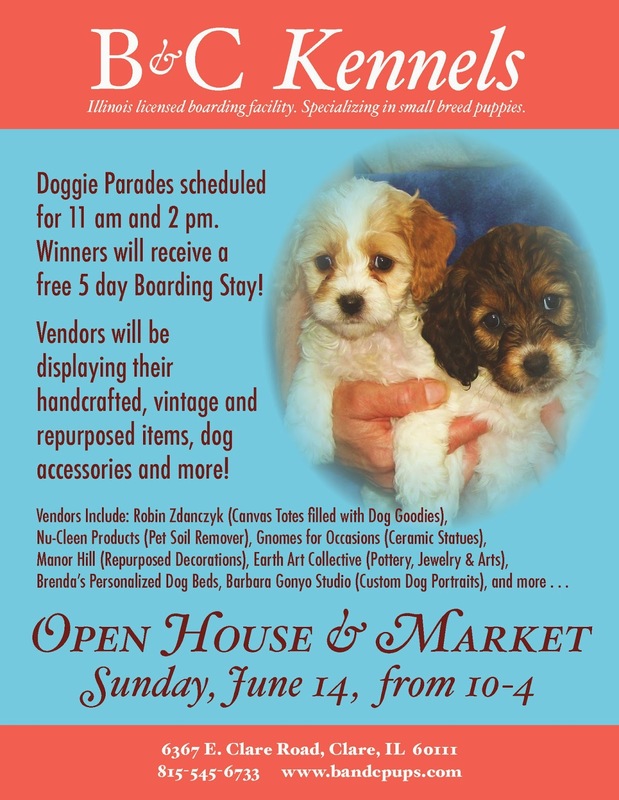 We will have Shih Tzus, Morkies, Yorkipoos, Teddy Bears, Schnoodles, Maltipoos, Poodles and Cavapoos. Give us a call to get on the wait lists. We wish everyone a very happy and healthy New Year. Ho, Ho, Ho . . . I have just updated the site to show what is still available. We still have some beautiful pups looking for their new homes. Our next litters of pups will be ready starting January 8. I have tried to make notes on the breed specific links as to what is going to be available and should have pics uploaded sometime next week. As always, we are thankful for each and every client that has come through our doors and given our pups a wonderful home, we are thankful to you site stalkers out there who even though they have gotten a pup from us, like to just keep an eye on the cutie pies and look forward to meeting many new friends this upcoming year. It has been a little crazy around here. We want to thank everyone that has ever visited our kennel in the past and express our gratitude for your patience during this hectic time of year. For those who have not yet visited, please plan to spend about an hour here. We know that everyone is busy. If you have prior commitments and you are going to be rushed, we would ask that you schedule appropriately when you have a little more time. We want to do our best in giving you our attention and direction as to what to expect when taking a new "baby" home. The seasoned pet owner, won't need as much instruction, however, we still have a checklist that we go over as we want the transition to go as smoothly as possible for everyone, especially the new four legged one. We have many great pups still available before the end of this year. I am making changes daily to the pages to try to keep it as updated as possible. With that being said, we are having a price increase starting January 1. The prices listed on the pages are for the current pups. If there are no pups available at this time and I have noted that we have an upcoming litter in January, I have already made the change. Most pups have been increased approximately $25.00. Asking for some consideration please!!! We had one of the craziest busy weekends we have had since opening. As hard as I try to schedule properly, it seems we have been getting incredibly backed up. We had families show up an hour late, an hour early and those with no appointments at all. It took a great toll on everyone involved. We are not a pet store, where you can just show up and walk down aisles looking at pups. No one but staff is allowed in our kennel. We have moms with their babies and they are very susceptible to picking up just about anything. One of our goals is to give each client our undivided attention as to choosing the right pup for them. We have a lot of information that we pass along in written and verbal form and this takes time. Please realize that when we schedule a visit for you, you are not the only person that will be looking at pups that day. It is very important that you show up as close to your time frame as possible. With that being said, we understand their are traffic delays and things that cannot be helped. It also means that if a family is having a hard time making a decision, we may be running a little behind as well. This is a very important decision that you are making. Usually a 10-15 year commitment and we want you to choose the right pup for you. As always, thank you for visiting our website and kennel. We truly appreciate each and everyone of you! Lots and Lots of new pups are going to be ready for their new homes starting tomorrow, October 23. We have gorgeous pups that will be ready tomorrow. You can check the links to the right for more information and pics of what will be available. We have Olde English Bulldogges, Maltipoos, Teddy Bears, Shih Tzus, Maltese, Yorkipoos, Morkies, Pugs, Yorkies, Chihuahua, Boston Terriers, Bichons, Schnauzers, Shihpoos and Dachshunds. I will be posting pics between today and tomorrow. New pups will be ready this upcoming weekend, starting Septebmer 25. We still have some beautiful pups available right now, in addition starting this Friday, we will new litters of Dachshunds, Yorkies, Westies, Bichons, Beagles, Schnauzers, French Bulldogs & Cockapoos. You can check the links to the right for each breed for specifics and pics. Just updated all pics and information on each breed this morning. We have added updated pics to most of the links on the pups that are currently available. Still a very nice selection. New pups will be ready for their new homes starting next Saturday, September 12. We will have schnoodles, schnauzers, Bichons, Maltipoos, Teddy Bears, Cavapoos, Cavachons, Puggles, Bostons, Poodles and Morkies. Info on the links to the right. We are scheduling now for next weekend. Starting to make appointments for new litters that will be ready starting next Saturday, August 29. We have some beautiful litters that will be ready next weekend. Teddy Bears, Poms, Shihtese, Schorkies, Shih Tzus, Shihpoos, Maltese, Bostons, Pugs and Frenchtons. Check out the links to the right for more info and pictures. Boatie is a Olde English Bulldogge that is 11 weeks old. He went to his new home two weeks ago but had too high of an energy level for the family. He is a great pup, loving and smart. They said he is potty trained and goes to the door when he wants out, never had an accident in their house and he does know the command sit. I played with him this afternoon and he kept crawling in my lap and gave me lots of kisses. He will weigh approximately 50-60# when full grown. He needs a home where kids can help him burn off his puppy energy or someone who can offer him a lot of attention and keep him busy with walks and hikes. His re-home price is $850.00. His date of birth is 5-20-15. Check the link to the right as we also have 8 week old Olde English Bulldogges available for $1200.00. We still have some very nice pups still looking for their new homes. We have decided to discount three of the pups. One male cocker spaniel who is 14 weeks old. Usual price is $650. On sale for just $500. Two Bugs (Boston/Pug Mix) one female and one male. They are also 14 weeks old. Usually $675.00. On sale for $500 each. Check breed specific links to the right for more information. Our Open House was a HIT! . . . Thank you to all that came to visit us on Sunday. The weather was iffy at best, but we sure did luck out. No rain, nice temperature. We met lots of old friends and made some new ones! All decked out for the parade! Hard to see in this photograph, but this is one of our schnoodles that came back to visit us. Longest eyelashes I have ever seen. I was calling her Elizabeth Taylor! Another of our friends coming back to visit! Our Open House is just a few weeks away! - Sunday, June 14!!! We have been working hard with our plans and finding good vendors for you to enjoy! 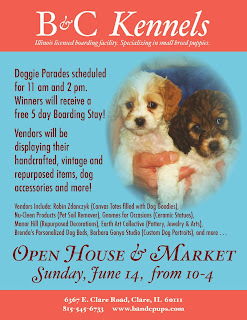 We will be having a puppy parade at 11 am and 2 pm. The winner with the best costume will receive a free 5 night boarding stay with us! I know there are many creative people out there. Come hungry! Our local 4-H will be selling hot dogs, sloppy joes and snacks. Lori one of our kennel workers is a member of this group. Happy Mothers Day to me! and all of the Moms out there! In celebration, we are closing for the day! We are scheduling appointments for the new litters on Friday and Saturday. The appointment book is going to fill fast! Have decided to discount a few more pups to make room for the upcoming litters. We have a gorgeous Olde English Bulldogge that is a blue fawn reduced to $1700 from $1850.00. Also discounted is a male chiweenie, normally $575 for $500, a Bichon Frise male normally $600 to $550, and two Porkies (Pom/Yorky Mix) one boy and one girl normally $575 to $500.00. Give us a all to schedule a visit! More info and pictures are on the links to the right. Three male Yorkies about 14 weeks old. We usually get $800 and up for these but they are not priced at $575.00. One little morky male about 9 weeks old. Usually priced at $575, discounted to $450. We have openings today for visits, give us a call to get scheduled. As always, thanks for looking at out site. All of the above have found their new homes!!! and I am getting excited. We have gotten commitments from some very cool vendors this year that I think you will love. The local 4-H will be providing hot dogs, sloppy joes and snacks for a very reasonable price. We have a vendor that makes these awesome canvas bags that are chock full of goodies for your 4 legged one, another vendor has awesome lawn type ceramics including gnomes for every sport team, another vendor will have thrown ceramics and hand-made jewelry, another vendor offers custom doggie beds, another vendor has awesome repurposed vintage items for the person that the 4 legged one brings along with them. Much, much more. I will keep you posted as time gets closer. We have a very large vendor area and are still able to accommodate a few more. If you items that you think would work for our event, please do not hesitate to contact me. We will be having a pet parade, so get those thinking caps on and start planning a costume! The grand prize winner will receive a 7 night free boarding stay here at our kennels. We have some gorgous pup waiting for their new homes right now!!! We have just reduced the price on the Jack Russell/Rat Terrier Mixes to just $300 each. This is a great price for a pocket full of pup. They have darling little personalities and will be under 10#. 3 boys and 2 girls are in the litter. We have also discounted 3 Yorky males to just $700 each. This is a great price for a quality Yorky! The Olde English Bulldogs are the prettiest I have seen. They are the very sought after blue color and I have seen this quality pup go for $3000 and up. We have ours priced at $1850. If I was able to add another dog to our pack, I definitely would be keeping one of these. Our Open House Event is scheduled for June 14. Please save the date. We will be having a doggie costume party, different vendors, some free stuff, a drawing for a 5 night boarding stay and much more. We are still looking for a few more crafters who would be interested in vending. The spaces are 10 x 10 and a very reasonable price of just $20.00. Ideally, you would carry some sort of dog related items, but we are also open to yard art and repurposed types of ware. Give us a call or shoot us an email if you have any questions or would like to schedule a visit. We will be listing the new litters that will be ready starting next Friday, April 24 in the next few days. But, here is a sneak peak and very exciting news for us. We are now breeding toy sized Australian Shepherds. They stay under 15# and are a sought after size, color and breed. Check the link for more info. We still have some darling pups looking for their homes this weekend! We have two cavapoos, which I usually have a long waiting list on. I do still have a waiting list, but those on the list are not quite ready for their pup. If you are thinking about a cavapoo, think about visiting us. It will be several months before we have any more cavapoo pups available and like I said, there is a long list waiting on the next litters. We have 1 male Westies and a male mini schnauzer. They are all in the 9-10 week age range. Info can be found on the links to the right. There are appointment times available this weekend. Give us a call. We are starting to schedule for next weekend when the new litters will be ready for their homes. We will have Maltese, Yorkies, Shih Tzus, Yorkipoos, Cockers, Cockapoos, Bichons, Maltipoos, Teddy Bears, Bugs, Pugs and Bostons, Shihpoos and Australian Shepherds. The first weekend that our new litters are available are usually very busy, so give us a call to get your appointment scheduled, if you are interested in any of the new pups. I am in the process of getting info and pics posted on the links to the right. As always, thanks for visiting our site. Shame on me for not making this announcement sooner. Michelle and Dakota have begun working in the office with me. They are very knowledgeable about our pups, training tips and such. Please help me in welcoming them to our kennel. Our celebration of our clients will be taking place on Sunday, June 14! This will be the second time that we are holding this event and hope to make it a yearly celebration. The last time we held it in August and our feedback told us that maybe earlier would be a little more comfortable time of year and maybe not so many folks on vacation. Anyway, whether you are a new or potential client, you are welcome to join us. We are still working out details, but we will have craft vendors offering pet related items, some free stuff, a bunch of sale stuff, $5.00 nail trims, a pet photographer, etc. At this time, we are still looking for vendors who can offer pet related items to our clientele. Your offerings do not have to be only pet related, but some of it needs too. This is a very good time for yard decorations as well. Spaces are outside, spacious and the fee is only $20.00 per spot. Tents are recommended. I heavily advertise and send invitations to all of my clients which is over 2000 alone. Please get in touch with us, if you are interested in vending. One way or the other, we hope you will hold the date and visit and have a fun day out in the country. Just about finished getting pics posted on all the new pups that will be ready starting this Friday! Several new litters are going to be ready for their new homes starting this Friday. Check out the links for pics and info. Still need to get a couple more pics done and will get them posted asap. As always, thanks for checking out our site. Feel free to give us a call for more info or to set up a visit. We had a crazy buzy day yesterday! We still have very nice pups available for their new homes, but quite a few found their new homes yesterday. Thank you to everyone that visited. New pups are ready for their new homes. We have several new litters ready for their new homes. The new litters consist of Cavapoos, Cockapoos, Schnauzers, Schnoodles & Shih Tzus. We still have a couple of boy Shihpoos and a couple of girl Yorkipoos that are about 9 weeks old. Info on all available pups can be found on the breed specific links to the right. Give us a call to schedule a visit. Still some beautiful pups available from our current litters. WE have a couple of Frenchy's, a couple of Shihpoos, a couple of Yorkipoos, A couple of Schnauzers and a couple of Shih Tzus. Check out the links to the right for more info. We still have a few pups ready for their new homes right now . . . Check the links to the right. We have a male chiweenie, a female chorky, a female teddy bear and a male schnauzer ready for their new homes. Our next litters will be ready for their new homes the weekend of February 6. I should have pics posted of them sometime this week. 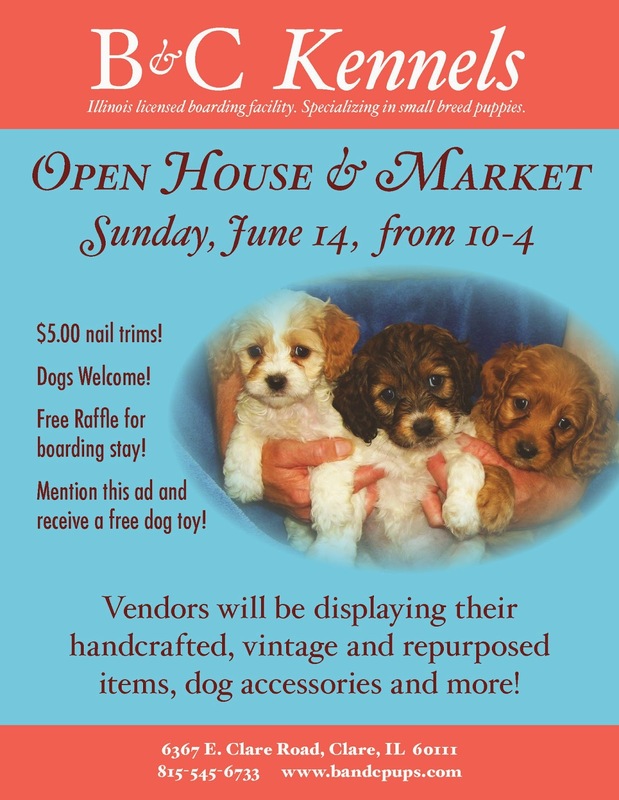 We will have schnoodles, Teddy bears, shihpoos, morkies, Cockapoos, Cavapoos, French Bulldogs, Yorkipoos, Maltipoos, Schnauzers and Shih Tzus. As soon as possible, I will get the pics and info on each link to the right. Give us a call if you want to be on the waiting list for any of the above mentioned pups. Ok, I think I have returned everyones inquiries ???? and a sale on those pups still here from last litters. I have answered all voicemails and emails as far as I know. If you contacted me sometime last week and I have not responded, please forgive me and get in touch again. I should be back on track now! Making appointments for all of the pups listed on the site at this time. We still have 6 pups hanging around looking for their new homes. They are 3-4 months in age. Many people think it is important to get the pup as early as possible for ease in potty training. I do not agree. I think a little maturity goes a long way when trying to housebreak a pup. They have bigger bladders and can hold it a little longer. People that take my older discounted pups tell me they trained very easily. So, if that is a concern, I don't believe it should be. One Rat Terrier: Usually $500 reduced to $250. Three Long Hair Chihuahuas: Usually $600 reduced to $250. One Maltipoo: Usually $575 reduced to $500. One Chorky: Usually $600 reduced to $500. One Chiweenie: usually $575 reduced to $500. These are great pups and will make wonderful family pets. More information can be found on the links to the right. Thanks for visiting our website. Lots of new pups ready for their new homes this weekend. We are back in the office and answering phone calls, emails and voicemails. I am doing my best getting back to everyone as quickly as possible, but did not expect the volume of return calls and such I would be facing. I am slowly working through the list. If I don't answer you or return your call by tomorrow sometime, please get in touch with me. I am worried that I might miss something. We are making appointments to see all the new pups starting Friday and Saturday, and I am working on getting pics on each of the links that are breed specific. Staff is on site daily, but we won't be conducting any sales from now through January 11. We are taking a brief hiatus. Staff is always here to take care of our boarders and such, but we are not available to show puppies until Monday, January 12. The links are current with what is and will be available once we re-open. You can leave a voicemail or send an email if you are interested in the upcoming litters. There are quite a few of you on the waiting lists for these litters. I will be sending pics out on Monday, January 12 and will be starting to schedule beginning Friday, January 16 for the new litters. If you are on the waiting lists, I will be contacting you that Monday. Don't panic, if you are on the list, all is good! If you are not on the waiting lists yet, send an email, stating which of the pups your are interested in and you will be added to the list in the order that I receive the emails. The new litters are: Cavapoos, Shih Tzu/Maltese, Shihpoos, Teddy Bears, Maltese, Maltipoo, Morkies, Boston Terriers and a small toy poodle. These are the pups that will be ready to be shown starting Friday, January 16. The other pups on the links that are still available can be shown starting Monday, January 11.